And finally the Lionel Messi dominance has been broken by Cristiano Ronaldo winning the 2013 FIFA Ballon d’Or. It’s no doubt that Ronaldo deserves it after a fantastic 2013 even if he didn’t win any trophy. That shouldn’t matter because it’s more about the performances. Speaking of performances, the award of the Ballon d’Or has been controversial at times like in 2010. So some players have deserved to win the award or at least be in the top 3. Too bad they couldn’t make it. I strongly believe that the award should not be handed out only to attackers. Yes attackers entertain us but what of the defenders that work tirelessly to stop the attackers from charging into the box and the goalkeepers that do superman flying stunts to prevent a wonderful goal from being scored? You might disagree with me and that’s ok. Please note that the Ballon d’Or used to be the European Footballer of the year award. It was merged in 2010 and with the FIFA World player of the Year award so using the term ‘Ballon d’Or’ refers to the former FIFA World Player of the year. I have compiled a top 10 list of players I feel could have been in the top 3. One of the most decorated footballers in terms of title medals. He’s got 13 league medals to his name in Manchester United Colours and I think that’s about the highest of any active player. Giggs is now 40 years old and will retire end of the current campaign. If we look back down the years, we can recall a speed maestro down the left flank that used trickery and skill to unsettle defenders and score some wonderful goals with the left foot. Giggs is no doubt a great player but if we look at his national team statistics, they are not fantastic. He’s never played at a major tournament because Wales never qualified but his individual brilliance could have merited him a spot in the Ballon d’Or top 3. A colleague of Giggs at Manchester United, Scholes is not doubt one of the greatest midfielders of his time. His skill, technique, passing ability, shot accuracy is something you rarely see in midfielders. He had been the catalyst behind much of Manchester United’s success over the years under Alex Ferguson. His brilliance was so vital that he had to come of retirement in 2011 to help Man United’s ailing midfield and he came back with a bang. Even England begged him to come out his early retirement in 2004 aged 29. He had been key for England even though England never impressed at major tournaments but Scholes’ performances never went unnoticed. Scholes has drawn praise from players all over including Ballon d’Or winner Zinedine Zidane, Runners up Xavi, Andres Iniesta among others including managers. It’s only unfortunate that all that praise never gave him a pick for the Ballon d’Or. Where do I start from with this man? 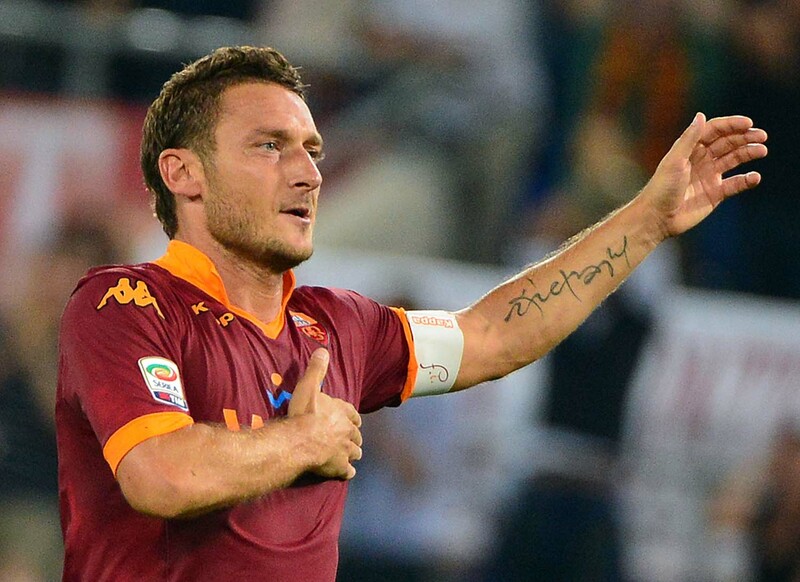 Ok, he’s Italian and when you mention the word ‘lethal’, I think Totti’s got it all. A highly skillful, technical, physical and mental player. A perfect taker of set pieces and a good finisher on goal. There’s nothing you are looking for in an attacker that you won’t find in Totti. Just looking at his attributes on Football Manager game will scare you. Virtually all attributes are in dark blue with rating of between 16 to a perfect 20 over a total rating of 20. The game didn’t give false attributes because it’s reflected in reality. He’s been in AS Roma his entire career. Born and raised in Rome, He is an important figure in the city as well as Italian Football. He is the top scorer in AS Roma history and second highest goal scorer in the History of the Italian Serie A with 231 league goals. He was top scorer in Europe in 2007. I get to wonder why such a player of Totti’s caliber has never been shortlisted as a Ballon d’Or finalist. Another Italian and like Totti is a technically gifted player. He had been instrumental to much of Juventus’ dominance in Italy and in Europe as well. Defenders feared Del Piero. He was the kind of player you wished was not your opposition. Extremely lethal, his performances have made him all time top scorer for Juventus with 290 goals as well as most appearances for Juventus with 705 overall appearances. He was also a crucial player in Italy’s 2006 World Cup victory especially in the semi-final against Germany. It seems unfair not to have considered Del Piero in the Ballon d’Or final 3. Can Pep Guardiola prove his worth this time?